What a fantastic deal! 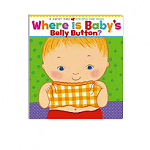 Get a free "Where is Baby's Belly Button" book! We have this book and my daughter LOVES it!!!! Book AND shipping will be FREE!!!!!! This IS a physical book, not a download! Enjoy!